There is a new shuttle for the machine. Piece can be found tin the little drawer under the table. Oberoid can do it. Repairman known by Bigmac can do it - Hans Volger http://www.hansvolger.nl/ - please call him and make an appointment at techinc, he's been there before. Bigmac will pay for the repair cost of 75 euro. Ask one of the super users for instructions before use. If something is broken, do not fix it yourself and contact the owners (they can be reached via Narya). Wear (safety) glasses! 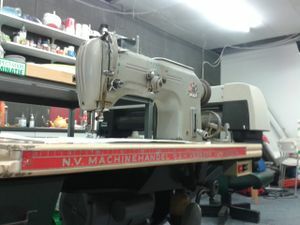 The machine runs much faster than ordinary sewing machines and is much more powerful. Just think of what could happen when the needle breaks..
Only use thin sewing oil!! (so no wd40 or other stuff) The right type of oil is in the drawer. Oil container on the top needs to have sufficient oil (red label should be below the oil surface). Check the level every time you use it. First, put needle into the fabric by hand, only after that start sewing. Otherwise, you'll easily break needles or do other damage. This page was last edited on 28 September 2017, at 08:59.